A couple of weeks ago I was performing one of my daily exercises swimming laps when I observed a women, in her early seventies, enter the pool and securely grasp hold of the side. She slowly made her way round the pool to the deep end by holding on to the side of the pool and moving her hands to guide her way to the deep end. She then let go and swam on her back all the way to the shallow end. I watched her repeat this routine over and over. Of course, I could not let an opportunity like this pass-by without asking her what she was doing by holding on to the side of the pool to get to the deep end. I asked her why she did not swim to the deep end. She explained that since she was a child, a fear of putting her face into the water had stopped her from swimming on her front. Her fear of drowning by swallowing water was so strong that for most of her life she could only swim on her back and feel secure. Swimming on her back towards the shallow end was acceptable to her mind-set, however if she reversed the routine and tried to swim on her back towards the deep end, fear overtook her and she could not release her hold from the side of the pool. Well, me being me, I explained to her how fear is an illusion of the mind, even though it be a persistent one. I gave her a few practical tips on how to overcome her trepidation of swimming on her front. I spent about half an hour showing her how to move a few steps from the shallow end, kick off the bottom of the pool, and float to the shallow side. She tried it a few times without success and told me she will work on her mind-set thoughts and keep trying this new technique of floating a few feet to the shallow side. I did not encounter her again in the pool for a few days. 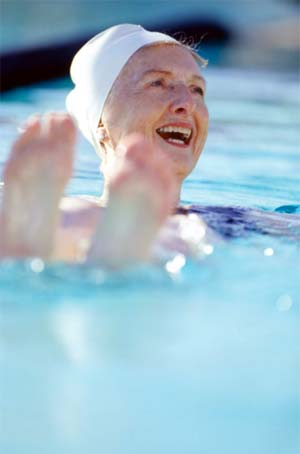 Well, a few days later what do you think happened to the seventy-year-old fear of not being able to swim on her front. The answer was ... nothing I could say or do could help her change her fearful mind-set. She continued to hold on to the side of the pool for dear life until she made her way to the deep end and then let go and swam on her back to the shallow end. She told me that she had thought about what I had said to her, but she just could not get over her fear of swimming with her face in the water. I jokingly said to her that perhaps her body was not made to swim face down and only constructed to swim on her back. Not realizing the humor she replied, what about all the other people who can swim on their front ... Why can they do it and I can’t. I replied, simple because they do not believe it is impossible to swim on their front. Now before you start to think that this woman is somehow unusual let me ask you a question... Can you live in a joyful state of mind, every second you exist in the pool of life? What is that you answer! You declare it is impossible to live in a joyful state of mind every second you are on earth. Well, what mind-set leads you to believe it is impossible? What types of thoughts have hold on your mind that limits your happiness? What are you clutching on to that restricts that natural flow of serenity and contentment? Are your thoughts of limited joy any different from the woman who finds it impossible to swim with her face in the water? By my observations of humanities, habitual patterns and characteristics, I have determined that most people in this world hold on to thoughts throughout their lives that restrict them from living in a natural free flowing way. Yes in - deed, most peoples brains have been influenced by perceptions, ideas, thoughts and suggestions from other people and are limiting the way they live their lives. While getting a good education well-meaning teachers may have seeded your thoughts. The thoughts may have been planted by well-meaning religious viewpoints but if you still hold fears what good is the religious doctrine doing to your every lifestyle of happiness. Well-meaning scientific experts may have planted the thoughts and delivered new inventions and hi-tech gadgets but how much lasting happiness does that contribute to your life of joy. Well-meaning family and friends may have planted the thoughts since you were a toddler however, how has that helped your well-being for long-term mental stability and permanent blissfulness. With massive amounts of intellectual, educational books, texts, journals and expert advice, no person is immune from synthetic thought patterns that can restrict the natural free flowing truth, intrinsically gifted in all human beings. How many people do you know who are not restricted in some way or other and have no need to hold on to unwise teachings that are seeded in their minds by other people? Maybe it really is impossible to teach old dogs new tricks. So why not just settle for getting-by with holding on to the sidelines of bliss and understand you are mentally constructed in that confined way. Just make do with the average joyless moments most people tell me is inevitable. What is the point in looking for what you deem to be unlivable blissful answers, no matter how truth-full they may be, but make no sense to your intellectual, thought-life possessor. Well, there may be one alternative to holding on to all elemental fallacies contained in … intrinsic doctrines, inbred intellectual reasoning and logic, informative philosophical debates, ingrained religious teachings, entrained educational rules and regulations, entrenched spiritual habits and other deep rooted meaningful ... Perceptions, Ideas, Thoughts, Suggestions (PITS) ... but I doubt you would believe me if I told you what it is. So rather than disclose to you how to live your life in a manner that is unacceptable to your knowingness, maybe I’ll give you a little hint into the types of mind-sets that can un-anchor your brain and cast you adrift from a more realistic mode of authenticity. If a person has a medium intellectual mind-set, it may suffocate them. However if a person can live with an objective detached mind-set, it will be a game, set and match ... liberating a winner/winner. So, if you feel it is impossible to live in a joy-filled mind-set all the time, just continue to endure sharing the unsatisfying holds on your mind, with others who also share your accustomed viewpoints. Keep away from all those other strange people, who are in the same mode, but with different slants on truth, but like you, holding on to the edge of the thought-life pool, without ever being in the free flowing blissful central moment. How about ... Contriving Orientation Navigators ... Thoughts that CON you out of a joyful-thought-life and navigate you into worrisome, depressive deliberations. The good news is that when you learn to live joyfully, despite what your conditioned mind-set may determine is impossible to live, you have overcome your fear for the truthful wisdom you were born with ... When your life ends, you will have no regrets of missed moments of joy ... And that my friend, is the only proper definition of success… The merry moments of blissfulness lived.